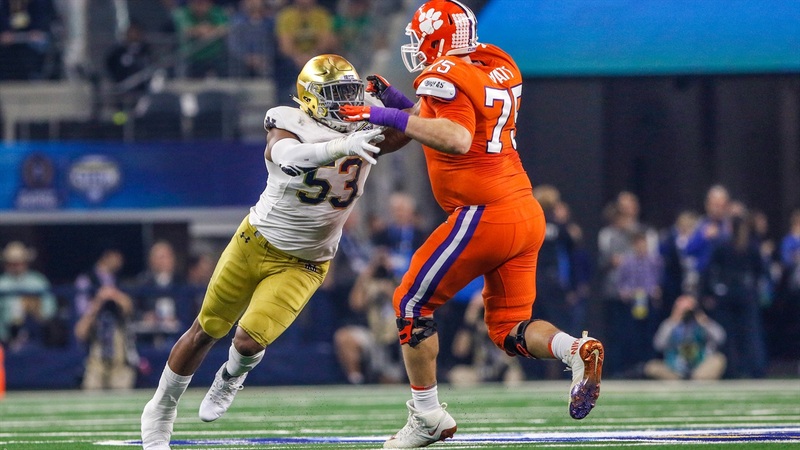 If Notre Dame was going to make the jump to become an elite defense in 2018, they needed a couple of their talented defensive ends to become elite players. The latter happened so it’s no surprise that the former did as well. The Irish got better and deeper at end this past season. And they’re losing no one for next season. Defensive end was one of the best positions on the team in 2018 and it should remain the same for 2019. It was a breakout year for Okwara. He tied for the team lead with eight sacks and led the team in tackles for loss. Along the way he emerged as one of the top edge rushers in the country. His biggest games on the stat sheet were Wake Forest (3.5 TFLs) and Northwestern (2.5 sacks), but I can’t think of a single game where he didn’t make an impact in terms of generating pressure even when he didn’t have that stats to back it up. It’s ironic that one of his biggest moments came in coverage when he had an interception in the second half against Michigan as well. The scary part is that he can still become a much better player against the run. He needs to be more physical at the point of attack and get better at setting the edge. If he does that and continues his progress as a pass rusher, then he could be an All-American for the Irish. Kareem played through an ankle injury the majority of the season and still made a significant impact. The upgrade at strong side end to him from the previous starter was significant. His 4.5 sacks did not reflect how good he was getting after the passer and he might have led the nation in holding calls against him that didn’t draw a flag. The fumble he caused against Virginia Tech, scooped up by Julian Love for a touchdown, is the one play that stands out from him, but his five pass deflections also made a significant difference. There was no defensive lineman for the Irish that was better at diagnosing plays. On a defense filled with great players, Kareem may not have been appreciated enough. The pairing of him and Okwara might be the best returning duo at defensive end in the country. As Okwara started to earn more playing time, it meant Hayes’ playing time dipped. He still was a big part of the defense, especially in Notre Dame’s Dime package, but Hayes clearly was the number two at the Drop position. He has improved quite a bit as a run defender over the last couple of seasons. The breakout as a pass rusher has not happened, though. At least not at the same level as Okwara. Hayes still needs to be more consistent with his hands and could utilize his spin move more often. He also has to simply finish more. He missed out on a couple of sacks in the Clemson game and there might have been a half dozen he missed over the course of the season. Finish those and he would be looked at a lot differently. This was Ogundeji’s first year in the rotation and he flashed impressively on a few occasions, most notably on his sack versus Clemson where he beat unanimous All-American Mitch Hyatt. While there were some times where Ogundeji got reached in the run game and didn’t react well to some blocks in front of him as quick as he needed to, overall he proved to be an effective player against the run and pass. On the season he averaged close to 20 snaps per game and that number looks like it should increase in 2019. He’s in a position to be involved in Notre Dame’s Dime package next season as one of the four best pass rushers on the team. Jones made the switch to end this past season and ended up seeing time at both spots for the Irish. He was in the rotation and ended up playing more often whenever a player in front of him was injured. He did get to play a bigger role in the second half of the Virginia Tech game after Okwara was kicked out for targeting and Hayes was out injured. There was a drop off when that happened and some of his inexperience at the position showed with some missed opportunities, but for the most part he filled in admirably when called upon. With everyone returning in front of him, he’ll need to show out this spring to earn a bigger role. Justin Ademilola qualified for a redshirt, but did get some playing time. In that same Virginia Tech game he was given an opportunity and flashed more than Jones. If they choose to lighten the load for the veterans at end in the spring, Ademilola needs to take advantage and prove he is worthy of getting into the mix. He has the talent to do so. It can’t be a great sign for Kofi Wardlow’s development that they chose to use Ademilola over him when they needed another option at Drop. I believe Wardlow was only in for one play the entire season so there is no way of knowing how far away he is from competing with everyone else. With Kareem, Okwara, Hayes, and Jones all entering their final season of eligibility, it would help ease a lot of concerns if Wardlow showed a glimpse this spring indicating he can be a player at some point for the Irish.